This is a traditional salad that makes for a great side dish or an excellent snack. I love adding a salad to my meal because it’s an easy and yummy way to add a lot of veggies to my diet. Plus there is also research to support that when you add fresh veggies, like salads, to your meal you actually end up eating fewer calories overall but feel just as full so it is a great way to help control your weight. Note: This salad is so easy to customize. If you want, switch up the dressing. Or use different toppings. Some of my usual traditional salad toppings also include tomatoes, red onions, and radishes, but feel free to add any veggies you like. Some of my favorites include cucumbers, bell peppers, beets, shredded carrots, broccoli, and snap peas. utritious include arugula, radicchio, and spinach. It’s good to add something that has a little protein and fat to your salad to both help with satiation as well as improves the absorption of fat-soluble nutrients. One of my favorites is a hard-boiled egg. Eggs are something that I think pregnant and nursing moms should eat most days. 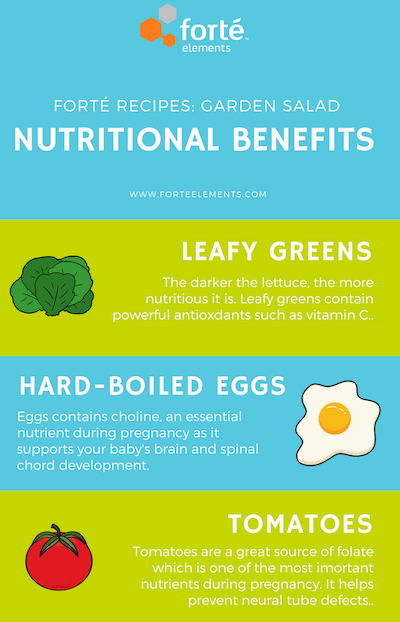 They are chock full of essential nutrients that are needed for optimal fetal and infant development including DHA and choline. They are also an inexpensive and easy source of protein, vitamin B12, riboflavin, and lutein. 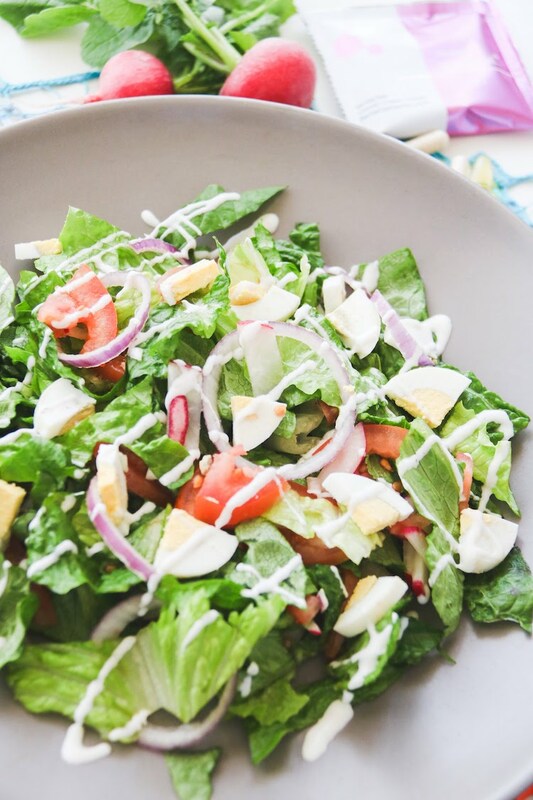 This is also the reason I recommend using a salad dressing, like ranch, that contains fat—so many of the healthful nutrients in salad need fat to be absorbed so steer clear of “fat-free” salad dressing.